Aaron Gordon had a career-high 21 points but went just 4 for 10 from the free-throw line and had only four rebounds in Arizona's win over Southern on Thursday. TUCSON, Ariz. — All he needed was a standing ovation. Heck, it almost felt like one for Arizona freshman Aaron Gordon when he hit back-to-back free throws midway through the second half. Then he hit a third. The fourth? Well, that grazed the rim and bounced out, but by that time, top-ranked Arizona was up by 16 with 14:32 left in the game and well on its way to a 69-43 win over visiting Southern on Thursday night at McKale Center. Arizona is 12-0 overall and a perfect 24-0 in nonconference regular-season games over the past two years. Life is that good for the Wildcats, even with 7-footer Kaleb Tarczewski out with an ankle sprain. Gordon had a career-high 21 points despite going 4 for 10 from the line, sophomore Brandon Ashley had 11 points and 10 rebounds, and junior Nick Johnson had 17 points in a comfortable win. "Playing under the pressure of coming to a No. 1-ranked university and against athletes like Arizona will hopefully help us in our conference," Southern coach Roman Banks said. "We won’t see (that) much talent, so I think it will make us better scorers and help us be more efficient offensively." Arizona wasn’t exactly that, but it didn’t need to be to get win No. 12. Such is life when one of the most exciting moments for the crowd comes when a player strings together a couple of meaningless free throws. "My shot is fine," said Gordon, who chuckled a bit about it after the game. "I feel like my mechanics are good. I think I need to pick a spot on the rim and just go with it. I’m thinking too much, but it’s something I’m not worried about." Neither is Arizona coach Sean Miller, who said Gordon hit 85 of 100 free throws earlier in the day at shootaround. "He’s getting better; he just has to relax and kind of let it happen in a game," Miller said. "I don’t know if he’ll ever be a great free-throw shooter this year, but he’s going to be better than the percentage he’s currently shooting at." Gordon, who entered the game having made 21 of 47 free throws this season, now is at 43.8 percent. Miller said he wouldn’t be surprised if Gordon reaches the 60 percent range by the end of the year. "I know I’m going to continue to improve," Gordon said. It’s pretty much a realization that I’m pretty much not making any free throws (when) you get a standing ovation when you make a free throw. It made me laugh. With every chance at the line, even the fans are holding their breath — or so it seems. And, apparently, with every made free throw comes thunderous applause. "It’s hilarious," Gordon said of the crowd cheering loudly for every make. "It’s pretty much a realization that I’m pretty much not making any free throws (when) you get a standing ovation when you make a free throw. It made me laugh. We have great fans. I just have to shoot a little bit better." Miller called Gordon’s career-high night a bit deceptive inasmuch as he could have had 25 or even 30. Of course, it was mostly the free throws that prevented it. But for Gordon, the missed free throws weren’t as much of a concern. From his point of view, it was more about his rebounds, or lack thereof. He finished with four, half of his season average. "Scoring is good, but I didn’t rebound well enough … at all," Gordon said. "I pride myself on rebounding, and to have a rebounding performance like that doesn’t make me feel I had a good game." He’s his own worst critic. And there are plenty out there. Just this week, nationally prominent websites varied from saying Gordon was the top choice for the Wooden Award to saying he needs another year of seasoning before jumping to the NBA. 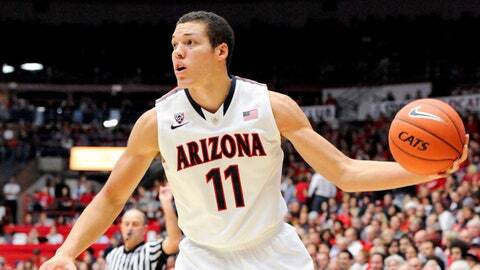 It’s long been assumed that he’ll be at Arizona for just one year. In truth, it’s somewhere in the middle. Gordon’s athletic ability is unquestionable and at a level rarely seen at Arizona in the past 30 years (Richard Jefferson, Gilbert Arenas, Andre Iguodala, et al), but his shooting has been spotty at best. On Thursday night, though, his percentage was more than commendable, as he finished 8 for 11 from the floor, with most of his baskets coming from near the rim. Miller said Gordon was good, particularly on the offensive side. But he also said that he spoke to Gordon to tell him he was "too talented" to have only four rebounds. "He’s too talented. He’s too gifted. It doesn’t matter what position he is playing," Miller said. "When he didn’t rebound — with Kaleb not in there, Aaron needed to have eight or nine rebounds. If he would have done that, I would have felt better about the victory. We’ve been so good in that area." Miller said he doesn’t yet know the availability for Tarczewski on Monday, when Northern Arizona visits McKale Center. But he added that he’s comfortable in continuing to sit the center until Pac-12 play begins in two weeks.